One of the most feared and revered snakes on the planet, the king cobra is renowned for its imposing size and deadly bite. But it also has plenty of other unique qualities: a distinctive voice, remarkable nesting habits, and a name that obscures its true identity. 1. THE KING COBRA IS THE LONGEST VENOMOUS SNAKE IN THE WORLD. This native of south and southeast Asia normally grows to be somewhere between 10 and 13 feet long, but the biggest ever recorded was an individual from modern-day Malaysia living at the London Zoo in the mid-20th century. From end to end, the animal measured 18 feet, 9 inches long. 2. TECHNICALLY, THEY AREN’T TRUE COBRAS. Despite that common name, king cobras are not classified as true cobras, which belong to the genus Naja. The king cobra is the sole member the genus Ophiophagus; genetic evidence suggests that these big snakes are more closely related to the mambas of sub-Saharan Africa than to true cobras. Physically, there are many things that set king cobras apart from true ones: Kings have proportionally narrower hoods than Naja species do; Ophiophagus’s head is larger relative to its body size; and at the base of the neck, king cobras have a pair of matching, elongated occipital scales, which are absent in Naja cobras. When threatened, king cobras spread their hoods to make themselves look bigger and raise their heads as high as 6 feet off the ground. But those aren't the only threatening tools in their arsenal: They also use sound to intimidate. Threatened kings take a deep breath and then rapidly exhale, forcing a burst of air through the tracheal diverticula in their respiratory tract which acts like a resonating chamber, resulting in a sound that one scientist compared to the growl of “an angry German shepherd.” It's much scarier than your standard issue hiss. 4. THEIR VENOM ATTACKS THE NERVOUS SYSTEM. Drop for drop, king cobra venom is less potent than that of some smaller snakes, such as Australia’s inland taipan. 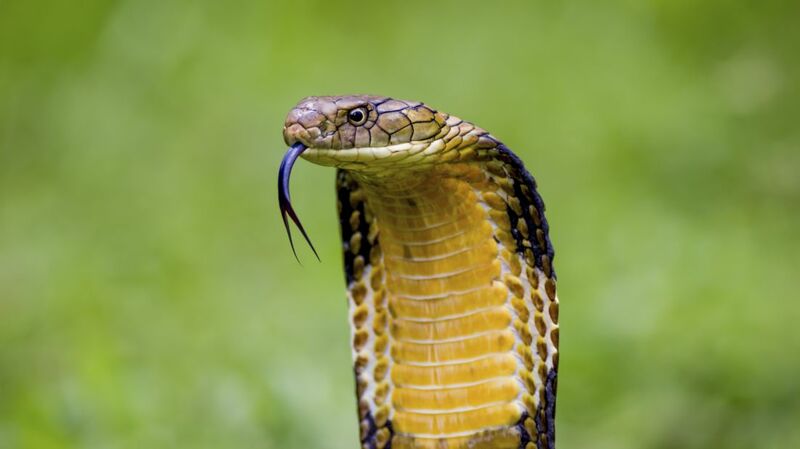 But when it comes to toxic chemicals, quantity can trump quality: With a single bite, a king cobra can inject as much as 7 milliliters of venom—almost enough to fill 1.5 teaspoons—into its victim. Different venoms do different things to the human body. Many vipers, for example, have venom that targets the victim’s circulatory system, destroying red blood cells as it spreads. But the venom of a king cobra inhibits communication between nerve cells, which can cause extreme dizziness, blurred vision, and—often—paralysis. Unless the right antivenom is administered quickly, a human bite victim can die within 30 minutes. Their venom is powerful enough that a single bite can kill a 12,000-pound elephant in just three hours. 5. THEY MOSTLY EAT OTHER SNAKES. Most true cobras have a varied diet that may include lizards, birds, rodents, and fish. But the king cobra almost exclusively dines on other serpents, a fact that’s reflected in its genus name: Ophiophagus means “snake-eater.” They're equal opportunity eaters, devouring harmless rat snakes as well as venomous kraits, various true cobras, and other kings. Not even pythons are safe (although king cobras apparently can’t swallow constrictors that exceed 10 feet in length). King cobras will also eat eggs and the occasional monitor lizard. Like many other species of animal, male king cobras fight over females during breeding season. First, the snakes size each other up, raising their heads as high as 4 feet off the ground. Then, they wrestle. Bodies intertwined, the snakes try to pin one another to the ground. (There's no biting involved—these snakes are largely immune to their own venom.) When one of the participants is finally pinned, he leaves. 7. SCIENTISTS SEQUENCED THE KING COBRA GENOME. 8. KING COBRAS ARE MAINLY ACTIVE DURING THE DAY. While many true cobras are crepuscular, king cobras snakes are diurnal, meaning they're most active during daytime. After sunset, they take shelter under logs, buttress roots, or termite mounds. 9. THIS IS THE ONLY SPECIES OF SNAKE IN THE WORLD THAT BUILDS NESTS. Snakes, by human standards, are not model parents: 70 percent of snake species lay eggs, usually in a convenient hole or crevice, and many will abandon their clutches immediately. But the king cobra is an exception. The reptile builds a nest. First, the female gathers leaves, using her coils as a makeshift rake. After she lays 20 to 30 eggs in the middle, she gathers more leaves, layering them over her clutch (the decomposition of the leaves helps keep the eggs warm). The process can take four full days to complete, after which the female curls up on top of the nest for the next two or three months until the eggs begin to hatch. Females don't eat the entire time they're guarding the nest and are unusually aggressive, lashing out at pretty much anything that comes too close—but just before the eggs hatch, they take off. 10. BABIES—AND SOME ADULTS—ARE BANDED. At birth, baby king cobras are just around a foot long and, with alternating black and whitish-yellow bands running the length of their bodies, are more vibrantly-colored than adults. As they grow up, most snakes gradually lose the bands; when fully grown, king cobras have an almost solidly-brown or olive color scheme (though the snakes do have faded yellow bellies). But not every snake goes solid: In Myanmar, adult kings tend to remain banded. 11. THESE SNAKES CAN LIVE TO BE OVER 20 YEARS OLD. In captivity, the king cobra’s average lifespan is 17.1 years; 22 is the oldest verified age for this species. 12. KING COBRAS ARE GREAT CLIMBERS AND DECENT SWIMMERS. While kings do most of their hunting on solid ground, they can often be found hanging out in trees and will occasionally stalk their prey high above the forest floor. One individual which had been fitted with a tracking device pursued a pit viper up into the canopy of a south Indian forest, climbing more than 65 feet off the ground in the process [PDF]. And while no one would describe them as semiaquatic snakes, king cobras have been known to swim for short distances.